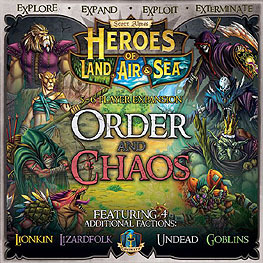 Heroes of Land, Air & Sea: Order & Chaos expands on the epic tale of Aughmoore's many conflicts, introducing 4 new Factions: Lionkin, Undead, Lizardfolk, and Goblins. As players reach milestones through building, recruiting, or war, they gain access to many advantages and Victory Points. Achieving one of four "X-Objectives" will end the game: eXplore, eXpand, eXploit, or eXterminate.